Fast-moving consumer goods (FMCG) major Modi Naturals has added the Peri-Peri flavour to Pipo, its popcorn range. With this addition, it has strengthened its product line in the ready-to-cook food segment. Already trending flavours under the Pipo brand, such as Desi Cocktail and Cheese Burst, have become an integral part of prime-time snacking, and a fusion blend of exotic Peri-Peri chilli with premium American corn is the latest addition. “Although certain brands have already made India familiar with the usage of this African chilli for cooking meats, mixing this extremely strong and aromatic spice with popcorn is entirely new,” said Akshay Modi, executive director, Modi Naturals Ltd.
“It is something every Indian would instantly relate to as our taste buds yearn for spices and this exotic flavour will be perfect for in-between-meal snacks. This flavour will be popular among all age groups. One can shop for this delectable popcorn pack online as well,” he added. 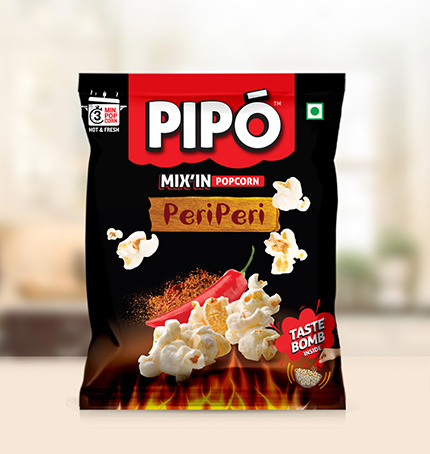 Pipo has added value to regular popcorn with a unique Mix’In taste bomb seasoning sachet that multiplies the taste and aroma of this snack. The use of premium-quality American wholegrain corn which is enriched with zinc, copper, fibre, antioxidants and other nutrients makes it a healthy snacking option. It has no added cholesterol and contains good fibre and other nutrients that have several health benefits. It aims to democratise the intake of popcorn in the country, because it is easy to cook, has a distinct flavour to offer and is an appropriate quick bite. As the country’s gourmet popcorn market prepares to expand at a compound annual growth rate (CAGR) of 36 per cent by 2022, adding new flavours to the quality popcorn Pipo will strengthen Modi Natural’s unique presence in the party snack food market further.